I need to get myself a Harry Potter t-shirt that says “I solemnly swear I’m up to no good” and wear it on snow days. Because I go a little crazy. 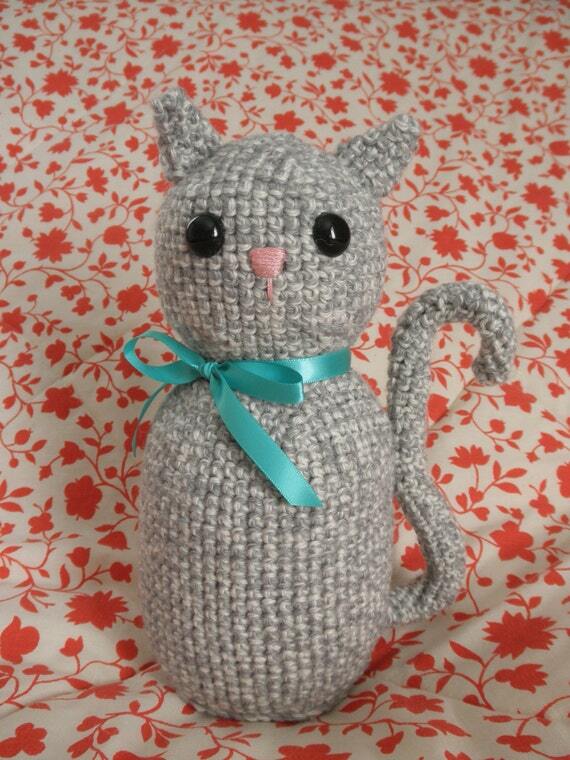 Cleaning, baking, crocheting, devouring shows on Netflix, and OH! DESTRUCTION! So my mom got me a really pretty soap dispenser for our kitchen a year or so ago and I decided it would actually look really pretty in our main bathroom. So yesterday I brought it upstairs and the stupid tile toothbrush holder that is affixed to the wall was (keyword: was) totally too low for the dispenser to sit in a logical place and still be usable without being in the way. This morning, as I drank coffee, I googled “how to remove a ceramic toothbrush holder” and found a really helpful article on eHow Home. I asked the Man about the Dremel, and he said sure, we could buy a bit, it’s cheap, but not today because of that whole snow thing and he had to leave for work in less than 2 hours. Okay, not a problem. So he goes to work, I reorganize my office and move my bookcases onto different walls (oh yeah, forgot to mention that! hehehehe…. that’s another post) and then I’m bored. 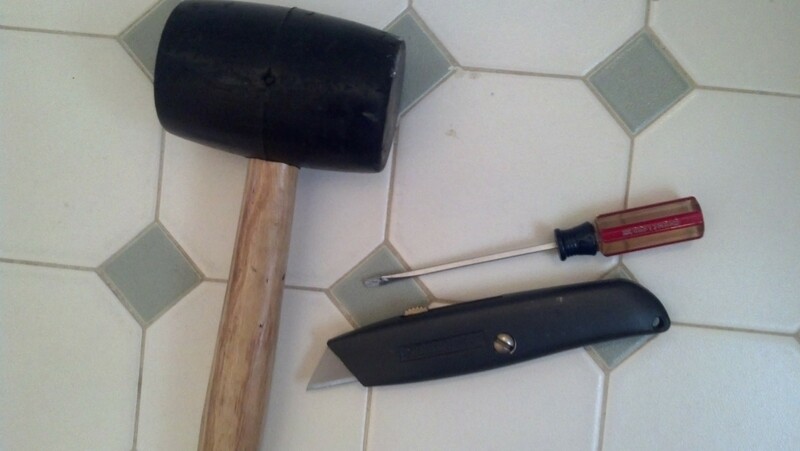 I’m trying to quit smoking, so I need to keep myself really busy, so I decide screw the article, we’re gonna see what a mallet and a finely tipped screwdriver does. Yay! Great idea! For starters, you need safety equipment. So what I wore was a black Marine Corps hoodie, red/pink plaid flannel PJ pants from LL Bean, slippers, and my everyday glasses. You also need to assume you’re not going to be successful, so don’t bother taking pictures with your actual camera, just use your phone. 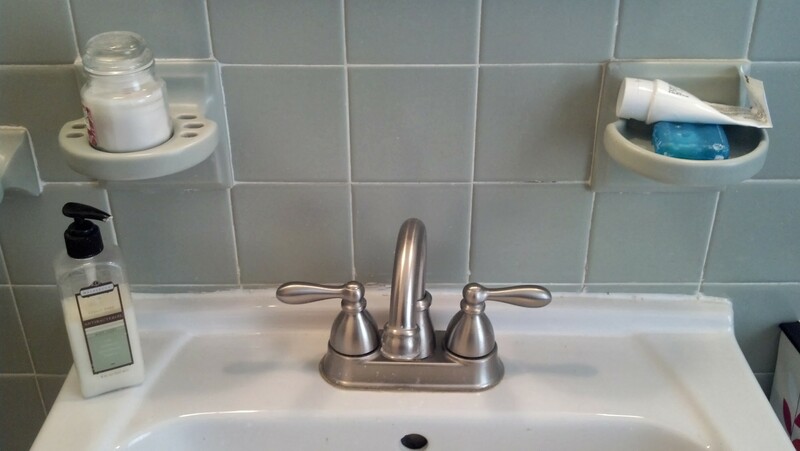 I closed the drain to the sink (I did read the article, just ignored a lot of it) and put a towel down so that any flying chunks wouldn’t damage the sink top. I then got the vacuum, closed the bathroom door, and began trying the utility knife. That did nothing to the grout, so I started working the screwdriver around the edge and pounding with the mallet very lightly. The grout actually started coming away really easily. At only point, I got a whole CHUNK to come off and was really excited! So what did I do next? The next logical thing, of course. I aimed with the mallet, turned my head, closed my eyes, and just SMASHED the holder. About 3/4 of it came off and I jumped up and down like a 5 year old I was so excited. The whole process only took about 30 minutes. I vacuumed a lot in between so I could see where I was working. Of course, there was no tile behind the holder, so I was left with a bit of a hole. The DIYer in me took a step back and thought: “Hmmm…. 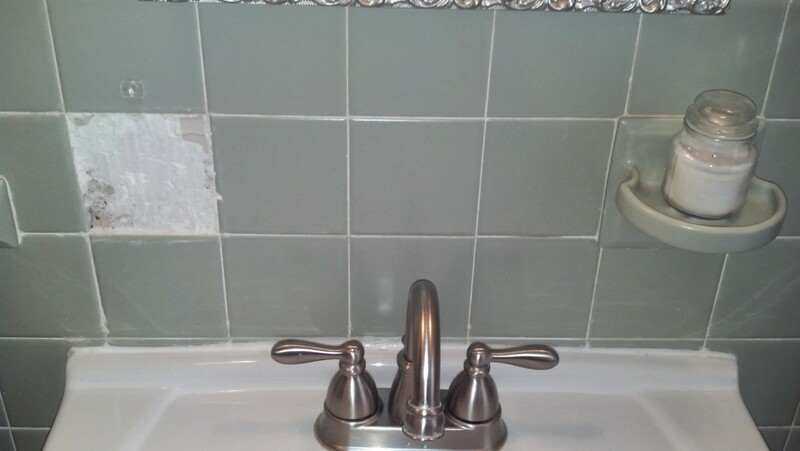 I’m not going to replace this with another tile, but I don’t want a hole showing. So what do I have that I could artfully cover up the hole with?” TADA!!!!!!!!!!! It’s a frame I’ve had for FOREVER from Ikea, hung on a tiny little Command hook. 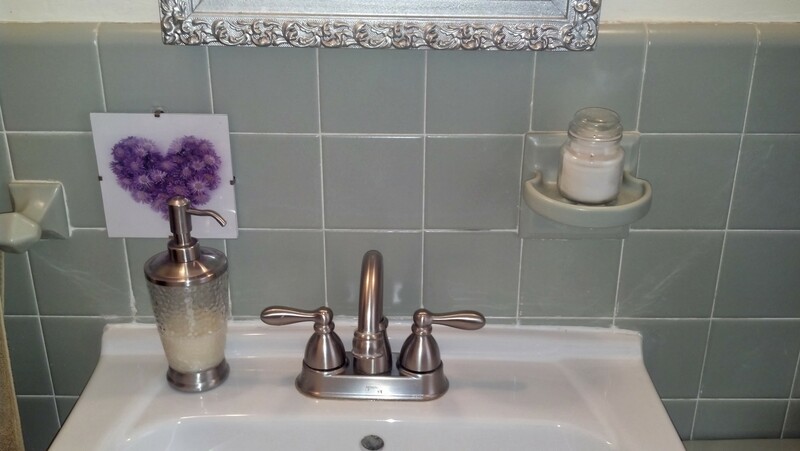 I don’t think I’ll get rid of the tile soap dish, mostly because it’s convenient if you need to take off a pair of earrings or a ring before you shower, and it’s not in the way. 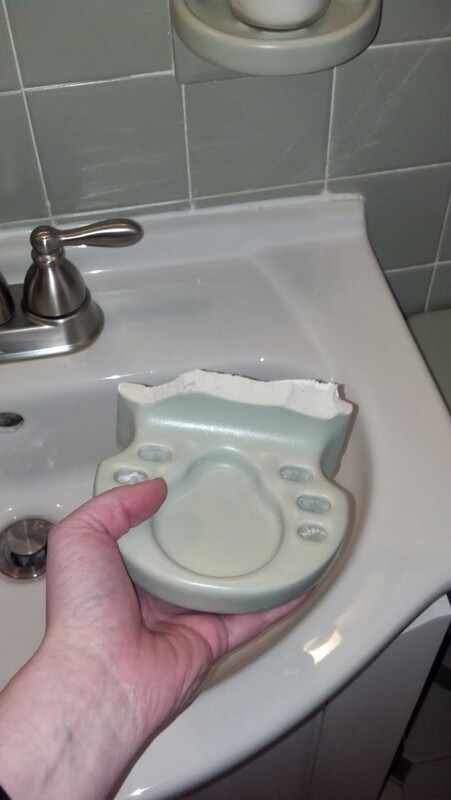 If you have a ceramic toothbrush holder you hate, my best advice is to be careful, go slowly, and just get rid of it. My mom has told me repeatedly, and in the mostly loving way possible, that sometimes I’m just a little bit too stupid to know when I shouldn’t try something, and I laugh every time knowing she is totally right. It may be a little change, but I couldn’t be happier. And I didn’t even break a finger or toe! Those slippers really are great for foot safety.